Ahead of the Hill Business Summit staring on Tuesday in Darjeeling, plucking operations in at least three tea gardens were disrupted on Monday as the Darjeeling Terai Dooars Plantation Labourers Union agitated against non-payment of Puja bonus. Union General Secretary Bharat Thakuri on Sunday had threatened to halt plucking of first flush of tea leaves in the Darjeeling gardens demanding the clearance of last year's bonus. He claimed that only 14 out of 87 gardens in Darjeeling have cleared the dues. 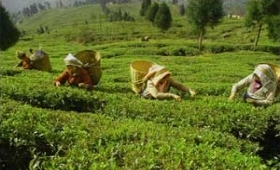 After a tripartite meeting between unions, tea garden owners and the government in September last year, it was decided that the bonus for the financial year 2016-17 would be paid at 19.75 per cent of the annual wage earnings. "Disruption of plucking operations in three gardens was reported on Monday and officials in these gardens were also gheraoed. Estate management are bound to pay bonus at the agreed amounts. "We sought more time as the industry is facing financial crisis. We have promised them to pay dues of bonus by March 23," the Darjeeling Tea Association's principal advisor Sandeep Mukherjee told IANS. The 87 gardens in the hills produce around 8 million kg of tea annually. However, production as well as the industry were severely hit last year following a 104-day strike demanding a separate state of Gokhaland. Meanwhile, Joint Forum of Trade Unions, an umbrella organisation of trade unions working in tea sector, alleged the state government was "reluctant to implement new minimum wage" for tea workers after the 10th round of minimum wages advisory committee meeting held in Kolkata on Monday. "The outcome of today's meeting is not satisfactory. The government was supposed to table a calculated amount for minimum wage. They again took time to prepare it and proposed to pay Rs 9 on account of entitled food grains money value as an interim measure. "We will sit together in the next 3-4 days to decide our next course of action," Joint Forum's Covenor and Citu's General Secretary (tea industry) Zia- Ul-Alam told IANS. West Bengal government proposed an interim hike of Rs 17.50 to increase the remuneration from Rs 132.50 to Rs 150 with effect from January 1, 2018 in the last tripartite meeting.